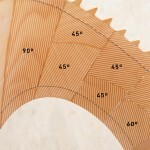 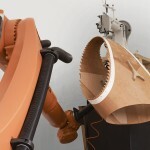 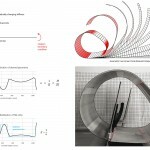 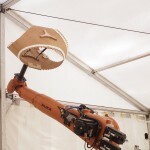 This project explores robotic sewing to not only join the individually bent plywood strips that form a segment, but also to prevent potential delamination. 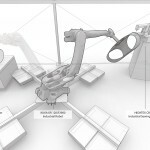 An industrial robot is employed for both assisting during the assembly and bending of the strips that make up one elements, and then locking the pre- assembled segment in shape by sewing them with a stationary industrial sewing machine. 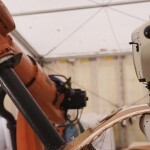 During fabrication the robot first moves the segment through the sewing machine so that the strips are connected. 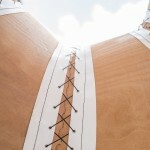 Then it guides the segment trough along its edge to secure the laminate and to attach the PVC covered polyester fibre membrane that form the lace connection between segments. 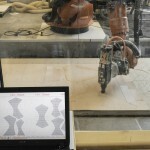 The robot and the sewing machine are integrated and controlled through a custom software. 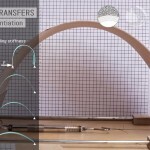 This ensures that there is no lateral movement during needle penetration. 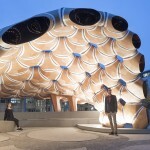 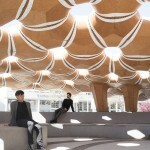 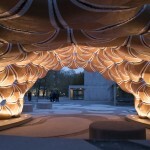 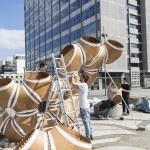 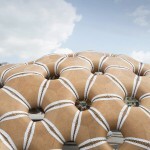 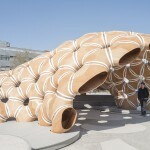 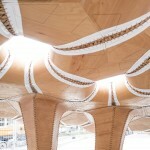 The pavilion consists of 151 segments that were prefabricated by robotic sewing. 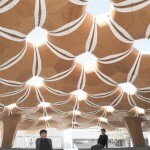 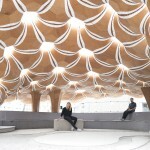 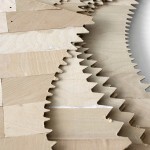 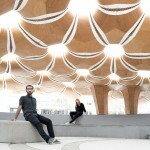 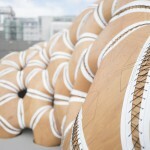 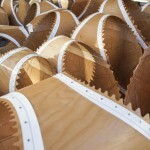 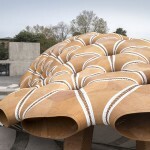 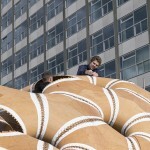 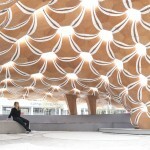 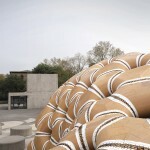 Each of them is made out of three individually laminated beech plywood strips. 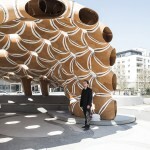 Ranging between 0.5 and 1.5 m in diameter, their specific shapes and material make-up are programmed to fit local structural and geometrical requirements. 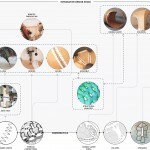 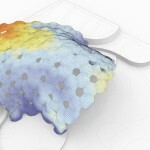 The textile connections developed for this project allow overcoming the need for any metal fasteners. 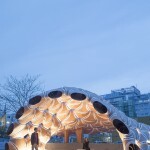 The entire structure weighs 780 Kg while covering an area of 85 m2 and spanning 9.3 meters. 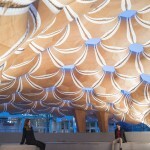 With a resulting material thickness / span ratio of 1/1000 on average, the building has a structural weight of only 7.85 Kg/m2. 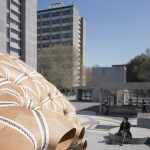 The overall design responds to site-specific conditions on the university campus. 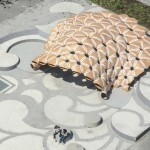 It establishes a semi- exterior space that integrates the ground topography as a seating landscape and opens towards the adjacent public square. 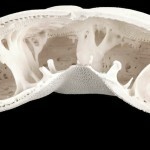 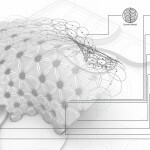 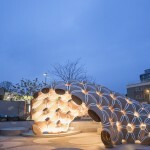 At the same time it demonstrates the morphologic adaptability of the developed system by generating more complex spatial arrangements than a simple shell structure. 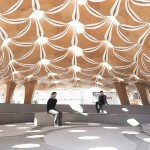 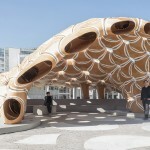 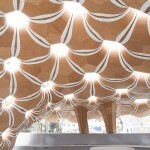 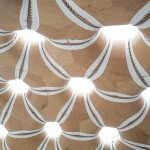 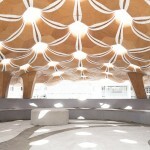 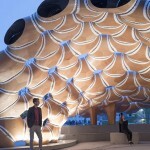 The research pavilion shows how the computational synthesis of biological principles and the complex reciprocities between material, form and robotic fabrication can lead to innovative timber construction methods. 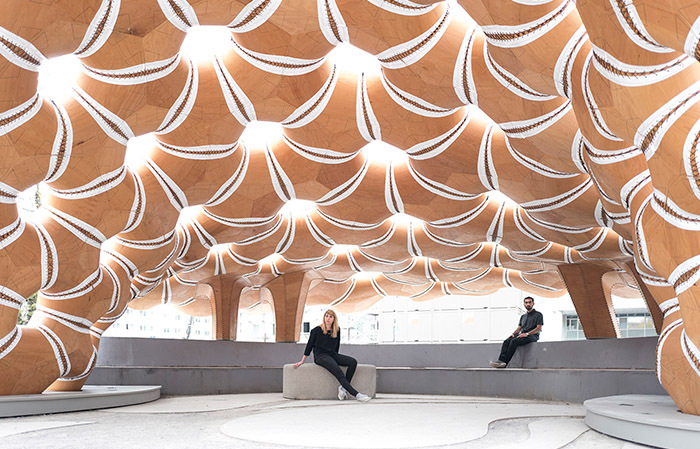 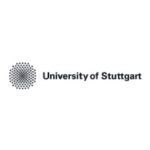 This multidisciplinary research approach does not only lead to performative and material efficient lightweight structure, it also explores novel spatial qualities and expands the tectonic possibilities of wood architecture.